IT’S TIME WE ALL BECAME ‘WATERSHED AWARE’. ends up in the Lake. The Owasco Lake Watershed is part of the much larger Oswego River/Finger Lakes Watershed, one of the largest in New York State and includes the drainages of the Oswego, Oneida, Seneca and Clyde Rivers. Its headwaters originate in the southwestern Adirondack Mountains in the east and along the northern edge of the Appalachian Plateau and flow across the central lowlands before emptying into Lake Ontario. The watershed includes most of the New York Finger Lakes; in fact, lakes make up about 6% of the total surface area of the watershed. 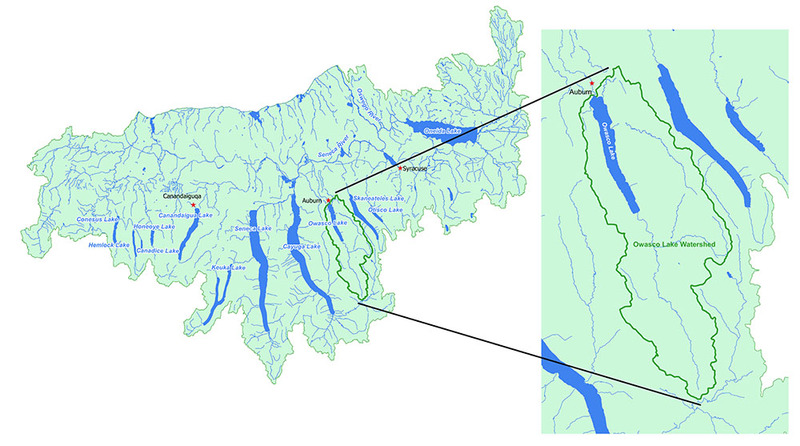 The Owasco Lake Watershed covers 208 Square Miles within the Oswego River/Finger Lakes Watershed. Owasco Lake is the collection point for all of the water used in the 2018 square mile watershed. 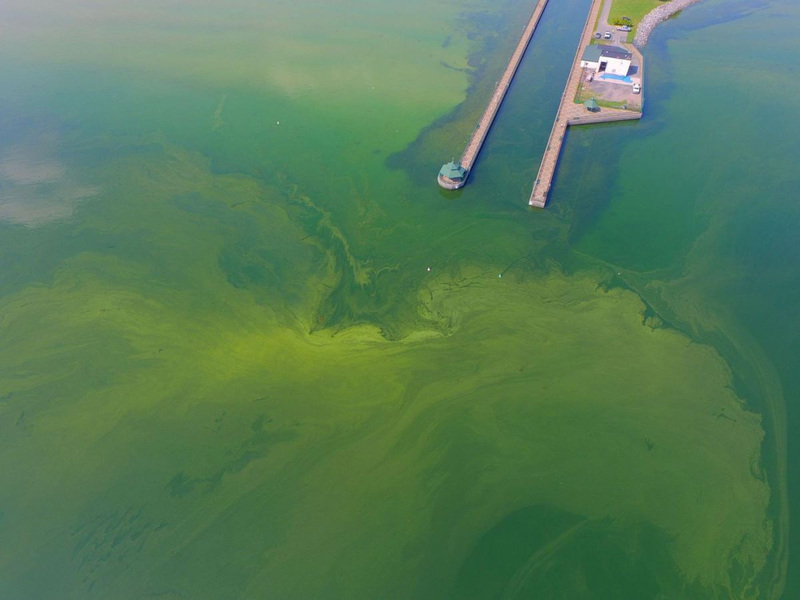 To prevent or minimize Harmful Algal Blooms (HABs) in Owasco and the other Finger Lakes, we have to look beyond the Lakes to the watersheds that drain into them. Look at this area map. Inside the dotted red line is the 208 square mile Owasco Watershed. All of the water used in this region, even in Groton, eventually finds its way to Owasco Lake. Just to the north is the City of Auburn which depends on Owasco Lake for its drinking water. Water in a watershed travels over suburban lawns and village streets, farm fields and forests. It rushes through storm drains and roadside ditches. It seeps into the soil and travels as groundwater. Along the way it may pick up pollutants in soil from construction sites, waste from septic systems, fertilizers, pesticides and chemicals. Even leaves and grass can have a negative impact if washed into a waterbody. By the time the watershed water reaches the Lake, it is loaded with a lot of additional compounds, including nutrients (specifically phosphorus and nitrogen) which fuel the HABs. Know more about how a watershed works! The Inspection Program’s mission is: to make regular and thorough inspections of Owasco Lake, its watercourses, and its watershed to ascertain compliance with the Rules and Regulations of the Owasco Lake Watershedand to provide educational outreach to the watershed community to foster lake stewardship. Oregon State University Ecampus video discusses how water moves in the large scale landscape and how location within a watershed affects a site. The Mississippi Watershed Management Organization works to protect and improve water quality, habitat and natural resources in an urban watershed that drains directly into the Mississippi River. Agriculture and Agri-Food Canada delivers federal programs under the Canadian Agricultural Partnership aimed at generating economic growth in the agricultural sector. HABs. An acronym for “Harmful Algal Blooms”. Anyone who keeps up with the news recognizes the term. HABs are becoming an all-too-familiar, and unwelcome, feature in fresh and salt water systems around the world Our own Owasco Lake has been hard-hit by HABs in the past few years. They can threaten the safety of our drinking water and our aquatic recreation, as well as the survival of other life that depends upon healthy aquatic ecosystems. The frequency and intensity of Harmful Algal Blooms (HABs) are increasing. According to the National Ocean Service (oceanservice.noaa.gov/hazards/hab/): Harmful algal blooms, or HABs, occur when colonies of algae grow out of control while producing toxic or harmful effects on people, fish, shellfish, marine mammals, and birds. HABs are a national concern because they affect not only the health of people and marine ecosystems, but also the ‘health’ of local and regional economies.